I've had my SmallHD 702 for a little while now (many thanks to Chris M for the GB), mounted inside a WC Director's Monitor Cage for a portable wireless setup. It's a great combo, especially on exterior gimbal/handheld shoots. However, there have been two issues that have made this setup fall a little short of the 100% reliability I would personally depend upon. 1) The 702 was never designed with a top mounting point, which doesn't work great with the top/bottom mounting options that the WC cage comes with. With only one 1/4-20 screw holding the monitor to the cage on the bottom edge, it always felt like a bit of a risk, especially with those excited directors waving it around and such. 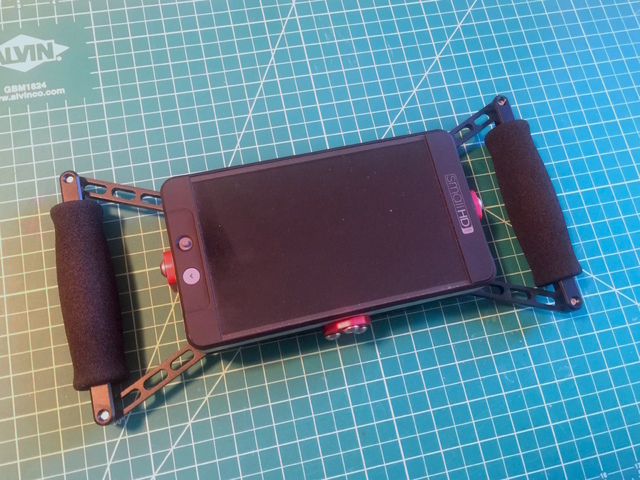 2) The WC cage was designed to cater for different sized monitors, which is great, but is its own downfall in that the four struts connecting the handles to the cage always come loose. I even tried sandwiching lock washers in there, which did the job under light use, but inevitably came loose (and scratched the parts up). Above: the handle struts are now incorporated into a solid wing (black) for each side. 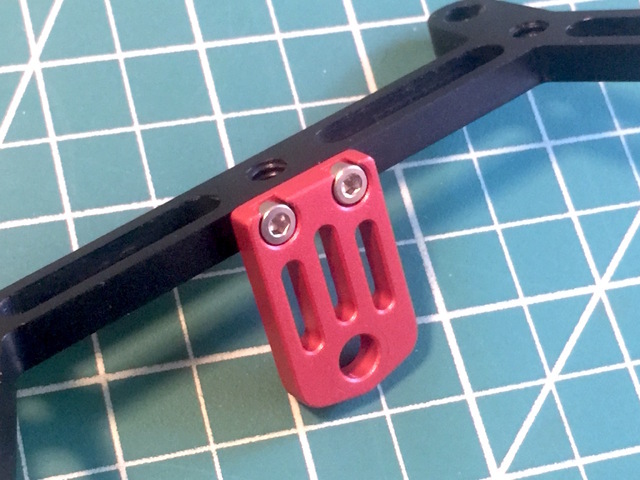 Two side brackets and one bottom bracket (red) provide the necessary attachment points and you can see that each includes two registration pins specifically for the 702's mounting points. Above: the bottom bracket connects the monitor to one of the WC cage's original parts with three 1/4-20 screws. WC's original plate allowed for mounting the entire rig on to a 5/8 stud, but my RX got in the way of this, so I left it out of the final design. 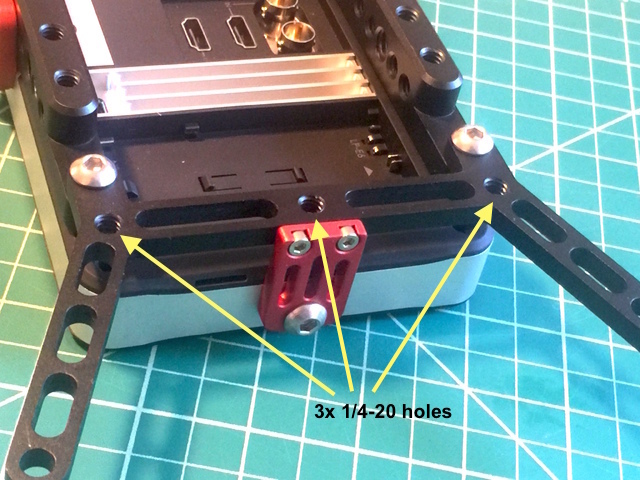 Above: the side brackets attach to the wings by two M3 screws. Above: each wing assembly then connects to the WC parts and the 702's side mounting points. These wings have been sized specifically for the 702 (or 702 Lite, 701 Lite), but it wouldn't take much to change the design for other monitors. Above: the final solution ... and it's ROCK SOLID ... with no loosening of the handles! For clarity, you still need parts from the WC director monitor kit. This is only meant as supplement pieces to make the setup more robust. This is a forum of creative minds so I welcome feedback and suggestions for future designs. Oh, and if WC are reading, please don't take my redesign as a slight on your products. It's only meant to be a bit of fun between shoots. This solution is solely for the 702 right? Because it can't be adjusted anymore....? Yes - this provides a non-adjustable solution for the 701/702 monitors. However, the CAD file can be adjusted for other monitor sizes. As it is now, it's going to be close to $250 including screws. Ideally it would be cheaper but small production runs tend to go that way. This prototype wasn't HARD anodized, so I'm not sure how it would stand up compared to other brands. The manufacturer has options to do that, but might mean an extra cost dependent on how many units were being ordered. I will look into it some more. 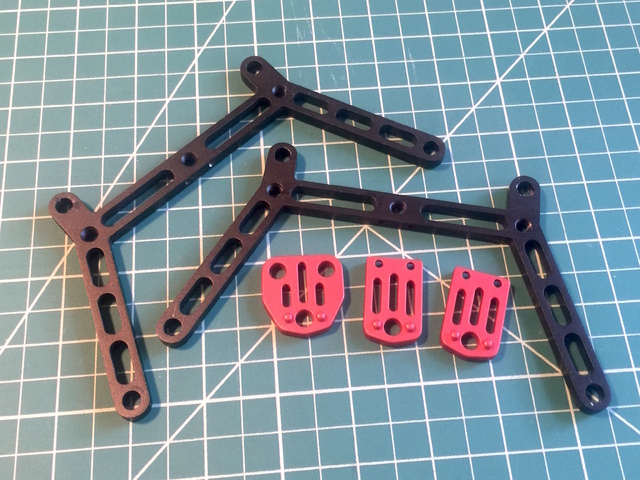 BTW, the plates don't necessarily have to be anodized red. Everything could be black ... or other colors are available if preferred. If anyone else is interested, let me know and I can put a list together. UPDATE: price lowered - see four posts down for updated prices. Last edited by Nicholas Wise; 06-30-2016 at 01:13 PM. Would you consider a redesign that doesn't require the WC parts and do a cost comparison? Maybe you can design it to work with some rosette handles from coollcd so that the major cost is in your cnc work. Otherwise it's $250 for your parts and $299 for the WC parts. If you could design a solution around $300 or $350 I bed you'd have more takers. PLEASE NOTE: you do still need elements of the original WC/ProAim monitor cage to make this custom fix work. If you're not sure, please PM me and I will talk you through it. Last edited by Nicholas Wise; 08-30-2016 at 01:17 PM.